[Roger’s] own compositions, some cast in the form of duets with other instruments and each one has a distinct mood and character. Tracks 1, 5 & 10 recorded April 2002 at Workhouse Studios engineered by Ian Tompson. Tracks 2, 3, 6, 7, 8 & 9 recorded April 2005 at Trinity College of Music Studio engineered by Kit Venables. Tracks 4 & 11 recorded May 2005 at Down Home Studios engineered by Richard Marcangelo. Mixed by Deptford Dave at Down Home Studios. Released October 2005 on StayTuned Records. 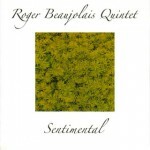 The vibraphone is capable of great tonal variety, from the tinkling of icicles to a warm, pulsating cloud of sound, and Roger Beaujolais deploys it all with consummate skill and delicacy. Most of these 11 pieces are his own compositions, some cast in the form of duets with other instruments and each one has a distinct mood and character. All of them are attractive and some, such as ‘Chasing a Dream’, with its light, pebbles-in-a-pool feeling, are quite magical. His timing is so good that each isolated note lands fractionally later than you expect, but when it does, it sounds just right. The complete quintet appears only on one track, the standard ‘What’s New?’, but each member has some telling exchanges with the vibraphone, especially pianist Robin Aspland and bassist Simon Thorpe. There is a quiet assurance about this whole set that characterises the best contemporary British jazz at the moment.